This dynamic Scottish Tribute to Abba have toured all over the world including Russia, Israel, Canada and Europe. With a team of West End standard singers and musicians including founder member Leona Marie who has had 3 top 40 hits, supported and sang with many famous names and been in the BGT semi finals to mention but a few of her achievements - see Biogs for more info on the team. 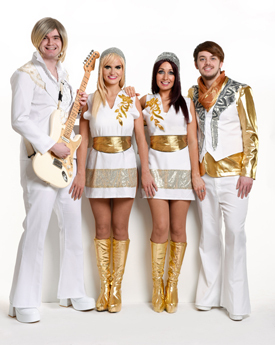 Their ABBA TRIBUTE BAND show features sequins galore, hot pants, platform boots and all your favourite Abba hits - all the best gold record selling hits from the super group - see Songs for full repertoire listing. This Scottish Abba Tribute Band features choreographed dance routines and comes self contained with a high quality state of the art Bose sound system and dazzling stage lighting. The band can also play music before / in between and after the show to save you hiring a separate DJ. * 6 piece full theatre show with drums and bass - great for large festivals / theatres (plus dancers also if required). 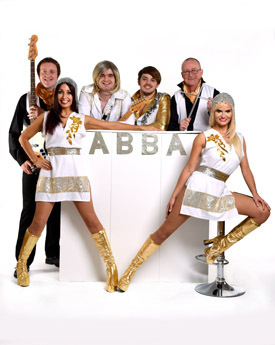 Abba A-Rival are experienced at performing their Abba revival shows in front of thousands at festivals but are equally as happy playing private parties or smaller venues. The team's many satisfied clients include P&O Princess Cruises, Glasgow Pride, The Russian President, Mercedes Benz, Heart FM, The Crown Plaza, Alea casinos, Village Hotels, Double Tree by Hilton, The Holiday Inn, Seven Seas Resorts, ITV , STV, RAF, Westend Festival, Pittodrie Stadium and many more. Their recent Scottish Theatre Tour includes the SECC Glasgow, Pitlochry Festival Theatre, Tivoli Theatre, Whitehall Theatre & Lanark Memorial Hall. Highlights of their career to date include a recent Channel 4 appearance on Come Dine With Me . They were a Youtube sensation - a story covered by the Daily Mirror online with their ABBA version of “3 Lions” during the 2018 world Cup. They recently reviewed the MAMMA MIA 2 movie for the Sunday Post and appeared live on air on BBC Radio Scotland. "Oh my goodness Abba A Rival were amazing! A very BIG thank you to the team, they made my (and others) night UNFORGETTABLE!" Scottish Abba Tribute Band - Abba A-Rival are made up of predominately music school graduates who have dedicated their careers to the love of music. As a full time tribute band they have full Public Liability Insurance, high spec PAT tested equipment and are reliable and professional. Aberdeen, Airdrie, Angus and Mearns, Ayrshire, Bute, Clackmannan, Dalkeith, Dumfries, Dundee, Edinburgh, Forfar, Glasgow, Greenock, Hamilton, Helensburgh, Inverness, Kilmarnock, Morayshire, Motherwell, Musselburgh, North-East Scotland, Perth, Peterhead, Portobello, Renfrewshire & Stirling.